A film archeologist could have fun with "The Master Gunfighter," sifting among its fragments of plot and trying to figure out what the hell happened to this movie on the way to the theater. The movie opens with a longwinded narration, in a hapless attempt to orient us, but not long afterward the narrator has to break in again—we're lost already. It's all to little avail. I don't think there's any way an intelligent moviegoer could sit through this mess and accurately describe the plot afterward. On the basis of the available evidence, I'd say the director and star, Tom Laughlin, began with a badly confused screenplay (one that never did clearly establish the characters and the main story line) and then shot so much film that he had to cut out key scenes in order to edit everything down to a reasonable playing time. The movie opens, for example, with Laughlin leaving the California hacienda of his wife, for obscure reasons (and not only the reasons are obscure—I had to read the synopsis to figure out the woman was his wife). Then there's a title card "Three Years Later" and he decides to go BACK to the hacienda, for more compelling reasons. This is pretty dizzying exposition. The movie has ambitions to look like one of Sergio Leone's Italian WesternsÑit has the eerie music and the vast landscapes and the irritating habit of opening and closing scenes with zooms as dramatic as they're arbitrary. Watching it, we reflect that Leone was never too strong on plotting either (what actually happened in "The Good, the Bad and the Ugly" remains a matter of great controversy). But Leone at least was the master of great momentsÑstretches of film that worked, even if they meant nothing. Laughlin has moments, too, but he has no flair for timing or development or surprise. 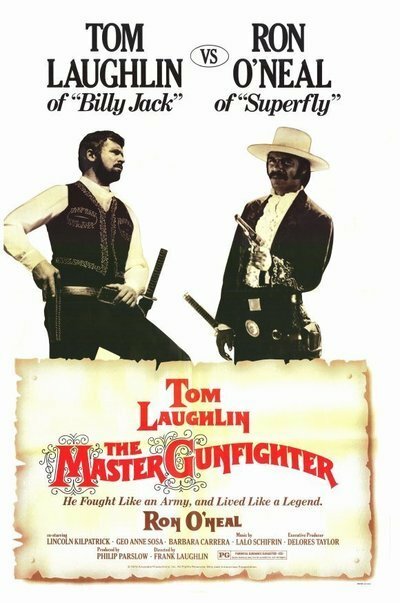 We leave "The Master Gunfighter" remembering very long, very pointless conversations in which the characters seemed to be referring to events in another film. These yawninducing dialogs are occasionally interrupted by swordplay, so badly staged and photographed we're not even sure Laughlin could handle a steak knife. In one of his predicaments, he is surrounded by enemy swordsmenÑso he backs up against an old shed. But wait a minute, you're thinking: If he's surrounded, how does he back up against that shed? What about the guys behind him? Aha! The opening narration provides some nonsense about samurai training that's supposed to explain the sword, as well as the MG's revolver, which can fire 12 shots. After we've seen the MG nail all kinds of bad guys with the pistol, only to use the sword in his next emergency, we're reminded of John Carter of Mars, the Edgar Rice Burroughs hero who kept getting sliced up in swordplay when he could have just pulled out his atomic ray gun But no matter. Nothing as simple as logic is going to explain this movie.